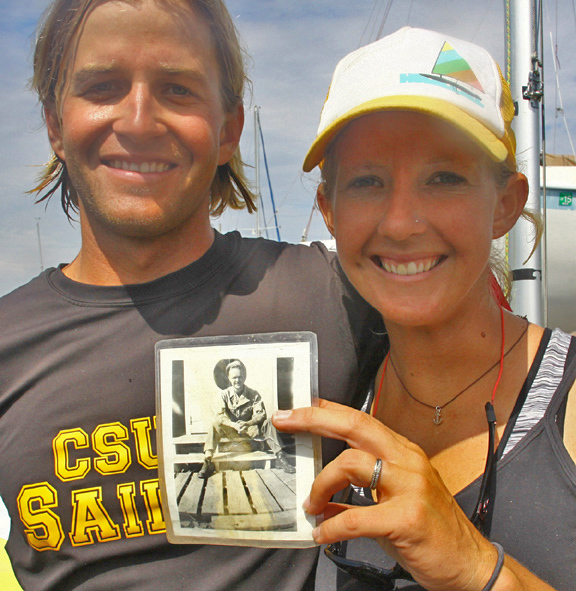 LONG BEACH – They sailed the oldest boat but it was a special boat that Mark Ryan and his crew, sister Sarah Schaupeter, drove to their second Lido 14 National Class Championship on Alamitos Bay Sunday, Aug. 3. “Grandpa’s boat,” they call it, number 2,506 in the line of more than 7,000 W.D. Schock dinghies dating to the late 1950s when Roscoe Orin Butcher launched it decades before the birth of his grandchildren, who christened it the Orin B. on the transom. In 12 races over two days, following a Qualification series that split the 45 entries into Gold and Silver fleets, the Orin B. lurked closely in the shadows of the top contenders until surging into first place by a single point with finishes of 6-4-2 in the last three races. First-day leaders Kevin Thomas with crew Amanda Wayne and defending champion Christophe Killian with crew Jack Martin both scored 77 points; Thomas/Wayne won the runnerup tiebreaker on a pair of first-place finishes along the way. Killian’s only first place was erased by his starting penalty, which he appealed to no avail, as did Raab. But it was their first time together in the boat since the 2010 Lido 14 Nationals, when they resurrected the craft. “We did it in grandpa’s garage with his tools,” Mark said. They couldn’t afford any errors. Killian, with three second places and four-time Nationals winner Chris Raab, with two firsts, seemed to be building to a final day showdown until both were nailed with 24-point penalties for jumping the start in Saturday’s last race. They struggled to stay on the pace, and Raab won one race while Killian scored a second. The sailors also battled light breeze of 5 to 9 knots shifting repeatedly between southeast and southwest, creating a challenge for the race committee to maintain a balanced, two-lap windward-leeward course on the small bay. In the end, Ryan and Schaupeter pulled it off with a close second place behind Chris Vilicich in Race 12. The latter’s crew was Greg Dair, who crewed for Killian’s title win at Newport Beach last year. The event organizers thank Jake Sorosky from Quantum Sails, Simmzy’s of Long Beach, Gresham Boards and the ABYC Junior program for their donations. 1. Mark Ryan/Sarah Schaupeter, ABYC/Leeway Sailing Center, 14-3-12-2-1-5-12-6-9-6-4-2, 76 points. 3. Christophe Killian/Jack Martin, Balboa YC, 2-5-2-8-2-24/OC-2-7-4-5-8-8, 77. Bruce Golison/Dina Corsi, ABYC, 16-2-3-5-5-1, 32. 5. Chris Raab/Scott McKeiver, Newport Harbor YC/ABYC, 3-1-1-7-3-24/OCS-7-10-14-1-12-3, 86. 1. Gabriel Ferramola/Melody Wong, 1-3-1-8-4-2-1-1-12-4, 37. 2. Bill Moore/Derrick Buczynski, ABYC, 4-12-3-6-1-1-2-4-1-3, 37. 3. Jeff Merrill/Pam Merrill, ABYC, 5-4-2-1-11-8-4-2-3-2, 42.